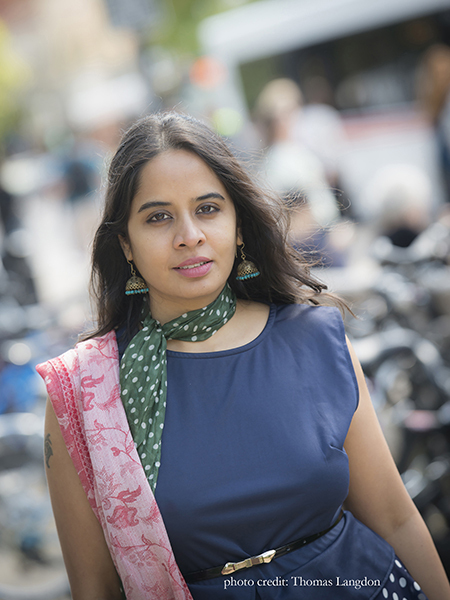 Rochelle POTKAR (fiction writer, poet; India) is the author of The Arithmetic of Breasts and Other Stories, and has three works in progress—a novel, a book of haibun, and a book of short stories. Her first book of poetry is Four Degrees of Separation (Paperwall, March ‘I6). Widely anthologized, a few of her stories and poems have been shortlisted or have won awards. Her works were dramatically read and interpreted by veteran actors and dancers on stages in Iowa and Portland, Maine. She has read poetry at several fêtes in Mumbai, Goa, Hyderabad, Chennai, Kolkatta, Hong Kong, and Iowa. Potkar also conducts creative- (flash fiction, poetry, haibun) workshops in colleges and libraries. She recently received a US grant for her upcoming project: a 2-week artists’ residency: Arcs-of-a-Circle. The Indian participants in this program will converge in Mumbai to converse on gender-based violence (GBV) through performative storytelling. At the time of my birth, my small town Kalyan, did not have a library. ‘Your mother-in-law is responsible for your husband’s sperm velocity. It’s got to do with genetics,’ the doctor says. The three boys jumped over the boarding school wall in the suede of night. They had scored 3 out of 20 marks and were horse-whipped 17 times. The teacher promised a similar punishment the next day too.